Just north of George Town, Seven Mile Beach is a beautiful stretch of white sand that curls around the west of Grand Cayman. A bit of a misnomer, Seven Mile Beach is actually only five and a half miles (8.8km) long, and is slowly shrinking due to erosion. A reef protects the coast and ensures that the water is blissfully calm and ideal for swimming and snorkelling. This is the most popular beach on the island and is bordered by dozens of hotels, but it is large enough to ensure sunbathers do not end up towel-to-towel. For day-visitors there are plenty of restaurants, beach bars, and even grilling facilities to relax at after a day of watersports. 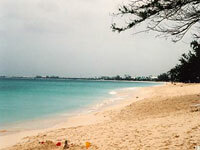 The calm and safe swimming conditions and ample space make Seven Mile Beach a great option for families with children. North of Seven Mile Beach is West Bay, the country's second largest town.